Single or Twin units available. 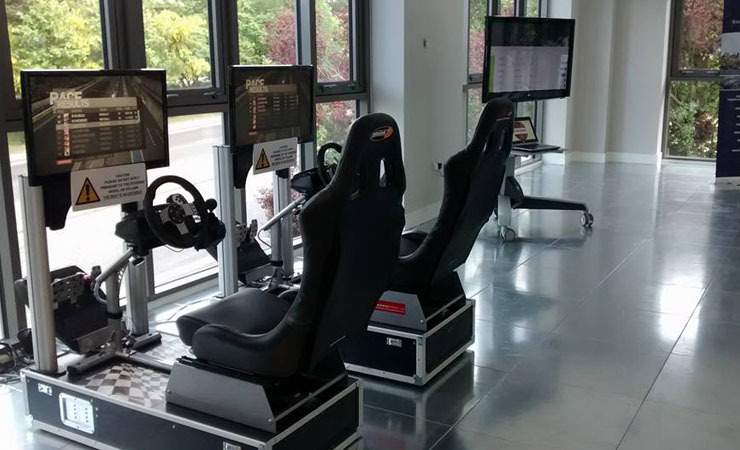 Experience these exciting Race car simulators. Each driving simulator rig features a Logitech G27 force feedback steering wheel with paddles and shift lights (game dependant), a manual gear shift leaver or steering wheel mounted paddles, pedal foot controls, sound system and a 50 watt tactile immersion vibration unit. The video display is a 27 inch class leading Illiama “back lit” 1m/s response time LED monitor. Your guests will be able to enjoy the competition of driving against each other or trying to gain the fastest lap time around a virtual circuit, all in the safety of your pit garage! You can select a “competition pack” comprising of a 1st, 2nd and 3rd place trophy, which your guests can compete to win. The format of the competition is generally practice in the first part of the day, with the race competition in the latter part of the day. Realistically however, you can run the event to meet your own timing needs. In this way your guests can have a great time competing safely to be No.1! This is the perfect way to ensure that your guests have the best time possible at your event. It can also be a very good way to ensure that your guests remember their day from start to finish. What better way to entertainment them throughout the day and have a chance to win something without risk. Hire packages are available to meet all sorts of budgets. We can provide a member of our staff to ensure that the simulator competition runs smoothly and to oversee the competition.